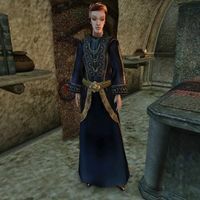 Vala Catraso, an Imperial priestess, is found behind the podium in the bottom level of the Ald'ruhn Mages Guild where she is on a mission to spread literacy to the Dunmer while teaching them the history of the Empire. She is also very knowledgeable about the various creatures you can find in Morrowind, and can offer you a great deal of information about them. Vala wears an expensive robe with matching shoes, amulet, and two rings. Aside from her natural charm and ability to absorb fatigue from others, she knows the following spells: Detect Key, Regenerate, Variable Resist Shock, Variable Resist Poison, Variable Resist Magicka, Variable Resist Frost, Variable Resist Fire, Variable Resist Common Disease, Rilm's Cure, Cure Common Disease, Shield, Ondusi's Open Door, Wild Open, Strong Open, Great Open, and Burden. "Yes, we are always looking for more history books. The students wear them out so fast. They don't always understand that the pages are only for reading, not...cleaning. I'm always looking for donations of all four volumes of "Brief History of the Empire."" "You have a complete set of "A Brief History of the Empire" to donate to the school?" Yes, here they are "These are exquisite! I've never seen their equal, %PCName. Where did you get them?" I stole them from Odral Selvi. [Disposition +20. Odral's History of the Empire 1 has been removed to your inventory. Odral's History of the Empire 2 has been removed to your inventory. Odral's History of the Empire 3 has been removed to your inventory. Odral's History of the Empire 4 has been removed to your inventory.] "I'll just pretend I didn't hear that last thing you said, whatever it was. Thank you for the books, %PCName." Consider them a gift from the Bal Molagmer. [Disposition +20. Odral's History of the Empire 1 has been removed to your inventory. Odral's History of the Empire 2 has been removed to your inventory. Odral's History of the Empire 3 has been removed to your inventory. Odral's History of the Empire 4 has been removed to your inventory.] "The Bal Molagmer? Well, with all due respect to this generous gift, I think I probably know more about that than you do. I've heard stories of their return, but you do not wear their trappings. These books are in excellent condition, %PCName. They should last at least a few months." OR [Disposition +20. Odral's History of the Empire 1 has been removed to your inventory. Odral's History of the Empire 2 has been removed to your inventory. Odral's History of the Empire 3 has been removed to your inventory. Odral's History of the Empire 4 has been removed to your inventory.] "The Bal Molagmer? I have heard rumors of their return, and now this. Those gloves are priceless, I hope you know. I don't know what to say. Thank you for the books, these should last at least a few months." "Those last books you brought me haven't worn out yet." No, nevermind "If you change your mind, I'll be here."